Former SA writer Joseph "Maxnmona" Fink has put together an amazing collection of short-stories, essays, poems and other fun tidbits all on the topic of adulthood. 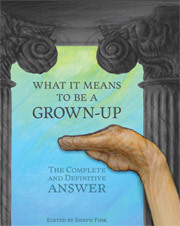 What it Means to Be a Grown-Up includes contributions from The Onion's Nathan Rabin, comedian Neil Hamburger, SA's own Kevin "Fragmaster" Bowen, and many other talented writers and comedians. Somehow I made it onto that list with the piece that follows. The first time my face turned into the grim rictus mask of a fleshless skull was also my first kiss. The lucky boy was Brad Dillford and it was the beginning of summer following an arduous sixth grade. I rode my bike to the park that day and by coincidence or fate I found Brad Dillford throwing rocks at the light above the dugout at the baseball diamond. Brad tortured me throughout fifth and sixth grade. I don't mean that childish confusion of lust and aggression that ends up in girls getting their hair pulled or their shoes kicked under the table. Brad pushed me down in puddles, threw juice in my hair, tore up my favorite folder, and wrote "you love gary klutcha" on my arm in permanent marker. I definitely did not love Gary Kleczka, who bit our math teacher and I think had Down's Syndrome. Brad had pet names for me like "Mere-breath" and "Smelly M" and "Fat Meredith," which was not clever at all and at least partly responsible for my struggle with my weight throughout high school and college. The single meanest thing he did to me was the time he "found" my missing lunch bag and then stared at me while I ate everything. When I finished he told me that he had taken it all out and farted on it in the bathroom. "So you'd get skinny," he claimed. I ate a chicken salad and Brad Dillford fart sandwich. Makes it kind of hard to explain how I got from wanting to poke out his eyes with pencils to smooching him in the picnic pavilion at Castle Family Memorial Park. He said, "Bet you won't kiss me." That was it. That was his line. I guess sometimes you hate something so much you start to love it. When our lips touched it was like a wet, Frito-flavored door to the future opening. I think we were both a little amazed. The passion was there. I realized I could love this boy, even if it was for all the wrong reasons. That's about when my face's skin and muscle melted off and my head turned into a skull. Brad Dillford ran screaming right into the oil drum trashcan with all the yellow jackets buzzing around it. "What's wrong?" I asked. I didn't know that my head was a skull. I thought I might have kissed him so badly it made him run screaming. It wasn't until I saw myself reflected in the chrome spit-guard of the park's drinking fountain that I realized why Brad was running. This wasn't just cheekbones poking through when I looked in my compact. Not another noseless face when I climbed out of the shower and wiped away the steam. I'd gone full-on skull for the first time and it happened seconds after my first kiss. Yeah, that will mess with a girl's self-image. I changed back after only a few seconds, but the damage was done. I ran all the way home and left my bike at the park. I locked myself in the bathroom - much to the chagrin of my sisters Diana and Madison - and sobbed my way through a whole box of tissues. When Dad got home he had to pry the story out of me through the bathroom door. He listened patiently, but when I told him I left my bike at the park and he finally said something. "You can't ditch your bike, baby. You're a Ghost Rider!" 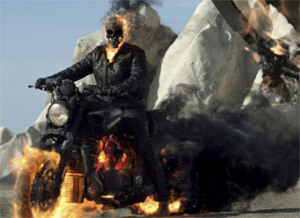 To be clear, my father wasn't THE Ghost Rider, not the one most people know about, but he was A Ghost Rider. But not me. I refused to accept that life. "No I'm not!" I sobbed through the bathroom door. "I'll never be a Ghost Rider. I hate them. I hate you for selling my soul to the devil!" "It was the souls of all of my children, not just you, and he tricked me. And it technically wasn't the devil. It was a lesser, but still-powerful, demon." That just made me angrier. I screamed at Dad to go away and covered my ears.